Biotechnological processes are promising alternatives to petrochemical routes for overcoming the challenges of resource depletion in the future in a sustainable way. The strategies of white biotechnology allow the utilization of inexpensive and renewable resources for the production of a broad range of bio-based compounds. Renewable resources, such as agricultural residues or residues from food production, are produced in large amounts have been shown to be promising carbon and/or nitrogen sources. 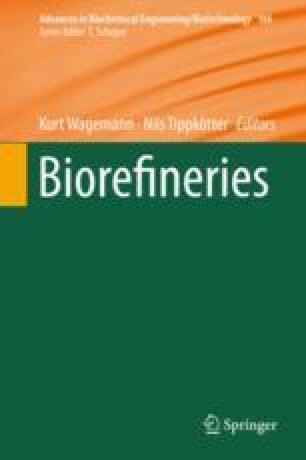 This chapter focuses on the biotechnological production of lactic acid, acrylic acid, succinic acid, muconic acid, and lactobionic acid from renewable residues, these products being used as monomers for bio-based material and/or as food supplements. These five acids have high economic values and the potential to overcome the “valley of death” between laboratory/pilot scale and commercial/industrial scale. This chapter also provides an overview of the production strategies, including microbial strain development, used to convert renewable resources into value-added products. The work presented by X. Yang and C.S.K. Lin on metabolic engineering of Y. lipolytica for the simultaneous production of succinic acid and polyhydroxyalkanoates is part of the research project supported by a grant from the Research Grants Council of the Hong Kong Special Administrative Region, China (Project No. CityU189713). Special thanks to Prof. Qingsheng Qi and Dr. Cuijuan Gao in the State Key Laboratory of Microbial Technology at Shandong University, China, as project collaborators for providing the Y. lipolytica mutant in succinic acid fermentation. C.S.K. Lin and J. Venus gratefully acknowledge the contribution of the COST Action TD1203-EUBis. J.B.J.H. van Duuren and C. Wittmann acknowledge the German Federal Ministry for Education and Research for financial support of the project “Bio-Nylon: Sustainable production of bio-based adipic acid as platform chemical” (FKZ 03v0757).